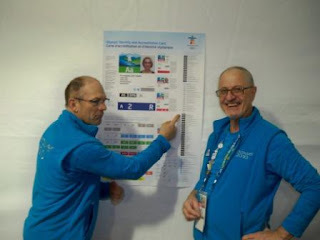 The last 72 hours were steady busy to intense, sensational to inspiring. Saturday started with the move six blocks east (yes, "Moving On Up!" to the eastside) from a hotel to a new abode on Marinaside Crescent at a company-rented condo facing False Creek and the Olympic Village (unbelievable!). 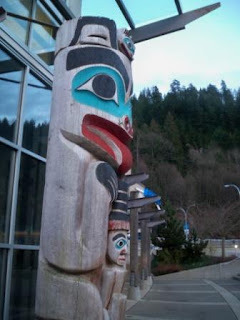 Completed a bit of pin trading that afternoon before trekking to Horseshoe Bay for a ferry ride to the otherworldly gorgeous Bowen Island, where our Vancouver office GM and his wife hosted a client dinner at Blue Eyed Marys, a small, family-owned fine dining establishment where the menu changes monthly (delicious!). 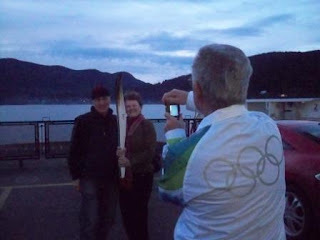 On the ferry out to the island, one of the island's local politicos (and really nice guy) was on the front deck sharing his torchbearer story from "up north, near Whistler" as families clamored to shake his hand and pose with or hold his Vancouver 2010 Olympic Torch. Very exciting to witness the spontaneous curiosity and awe of the kids of all ages checking out the local Olympic connection. 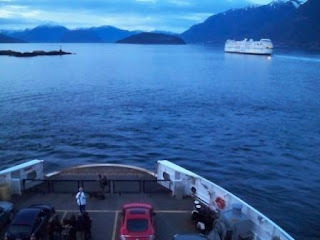 During the ferry ride back to West Vancouver, the sky was filled with dozens of synchronized searchlights (each night since Thursday there have been more and more searchlights shining upward across the city). "It's beginning to look a lot like Olym-pics" we sang in the car. Super Bowl Sunday was a day of exploration, starting with a Sky Train ride down near the Main Press Center (MPC) and International Broadcast Center (IBC) on the northern waterfront -- what a gorgeous building that convention center turned out to be (it was a big hole in the ground when first I visited Vancouver in 2006). 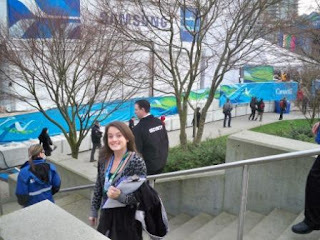 From the IBC, another train got me to the Rusky Dom Sochi 2014 Russia House at Vancouver's iconic Science World. The place was under heavy transformation into what will likely be a hot ticket destination during Vancouver's Games. 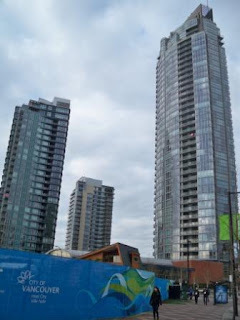 I could not help but hum Joni Mitchell's "Both Sides Now" while looking back across False Creek to the Edelman Olympic condo! 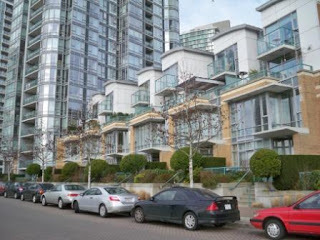 The Olympic Village (just south of Science World) looks spectacular! Also checked out the True North Media House, a social media centre for Vancouver's Games, which appeared to have a bit of work due to prepare for their planned opening this week. Monday was an intense day of media pitching, calls, research and follow ups on a variety of fronts. Some of this work was from the desk, but we're also hitting the streets and meeting (or getting reacquainted with) an astounding number of international media across downtown. 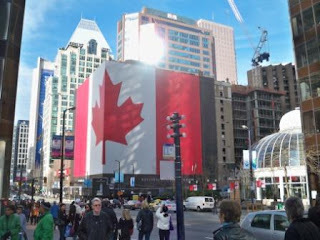 Monday afternoon also afforded me time with a national radio contributor front the U.S. as we both went through the MPC/IBC accreditation application procedures, visited The Bay (a client, where throngs of shoppers and media are in pursuit of Olympic gear) and lunch in the Vancouver's historic Gastown District. Monday night was the first night all three Games roommates were under one roof at the condo, with our first house dinner (delicious vegetarian soup and sandwiches and Bailey's-infused hot chocolate) capping three days of adventures. 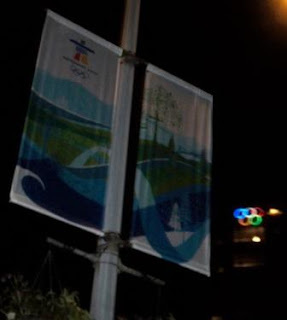 Tuesday was bookended with the Olympic Torch Relay. 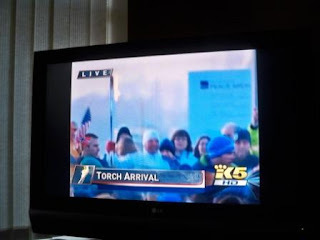 At dawn, KING-TV and KONG-TV of Seattle aired live coverage of The Flame's arrival at the International Peace Arch on the British Columbia-Washington border. 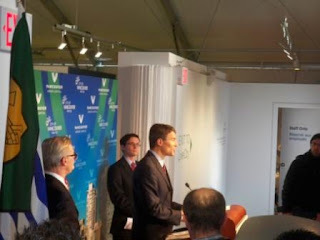 During the day, more media pitching, networking at a press conference with Vancouver's Mayor at (client) Vancouver LiveCity Yaletown, a walk through of the B.C. Media Centre at Robson Square, more media and client calls. Whew! 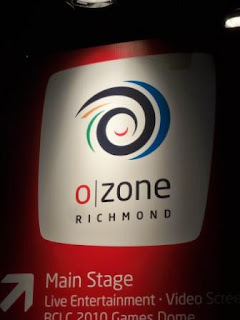 And tonight brought the arrival of the Olympic Torch Relay to the City of Richmond and "The O Zone" Olympic party area (definitely worth a visit during the Games -- I think my eyes spotted a Dutch House on site). Tens of thousands of locals gathered on what was, from what I could tell, a high school track and field area transformed into an outdoor concert and party venue. 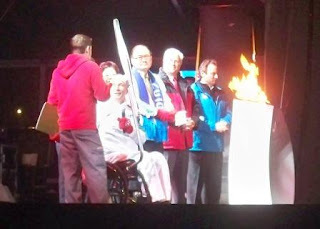 After some interesting live music and a lot of jockeying for a decent camera position, the Olympic flame reached The O Zone via torchbearer Rick Hansen (a client), Canada's world famous "Man In Motion." If you don't know Rick Hansen, you should! 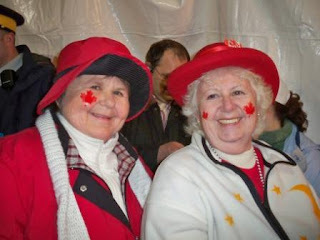 On several short lists of Canadian favorites who might ignite the Olympic Cauldron on Friday night at B.C. Place, during the 1980s Hansen won Paralympic gold medals before hitting the road -- a LONG road of more than 25,000 miles across 34 nations -- to raise millions of dollars for spinal cord injury research. More importantly, Hansen championed a movement to create an inclusive and accessible world for the disabled. His leadership during the last 25 years brought more than $200 million to the cause, but in his words tonight in Richmond, the journey is not over yet and his best work is still in front of him. In case you are wondering: Yes, that song from the film "St. Elmo's Fire" was inspired by and written for Rick Hansen's tour (once you learn about Rick, the lyrics really do take on a whole new meaning with so much more importance than any scenes of a youthful Demi Moore, Rob Lowe and Emilio Estevez). 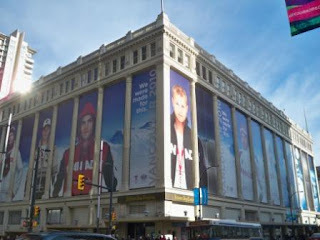 And during March and the Winter Paralympics in Vancouver, the Man In Motion 25th Anniversary is on March 21. And here's to less than three more days and nights to the Big O!